Radiation therapy is treatment with high-energy rays or particles that destroy cancer cells. This treatment may be used to kill any cancer cells that remain in the breast, chest wall, or underarm area after breast-conserving surgery. Radiation may also be needed after mastectomy in patients with either a cancer larger than 5 cm in size, or when cancer is found in the lymph nodes. Radiation therapy can be given in 2 main ways. This is the most common type of radiation therapy for women with breast cancer. The radiation is focused from a machine outside the body on the area affected by the cancer. The extent of radiation depends on whether a lumpectomy or mastectomy was done and whether or not lymph nodes are involved. If a lumpectomy was done, the entire breast gets radiation, and an extra boost of radiation is given to the area in the breast where the cancer was removed to prevent it from coming back in that area. Depending on the size and extent of the cancer, radiation may include the chest wall and underarm area as well. In some cases, the area treated may also include supraclavicular lymph nodes (nodes above the collarbone) and internal mammary lymph nodes (nodes beneath the breast bone in the center of the chest). When given after surgery, external radiation therapy is usually not started until the tissues have been able to heal, often a month or longer. If chemotherapy is to be given as well, radiation therapy is usually delayed until chemotherapy is complete. 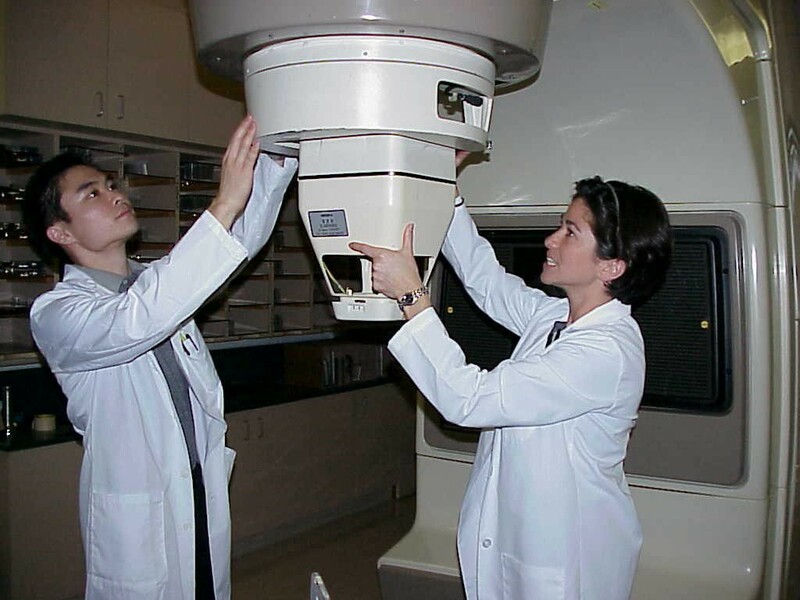 Before your treatments start, the radiation team will take careful measurements to determine the correct angles for aiming the radiation beams and the proper dose of radiation. They will make some ink marks or small tattoos on your skin that they will use later as a guide to focus the radiation on the right area. You may want to talk to your health care team to find out if these marks will be permanent. Lotions, powders, deodorants, and antiperspirants can interfere with external beam radiation therapy, so your health care team may tell you not to use them until treatments are complete. External radiation therapy is much like getting an x-ray, but the radiation is more intense. The procedure itself is painless. Each treatment lasts only a few minutes, although the setup time — getting you into place for treatment — usually takes longer. The most common way breast radiation is given is 5 days a week (Monday thru Friday) for about 6 weeks. Accelerated breast irradiation: The standard approach of giving external radiation for 5 day a week over many weeks can be inconvenient for many women. Some doctors are now using other schedules, such as giving slightly larger daily doses over only 3 weeks, which seems to work about as well. Giving radiation in larger doses using fewer treatments is known as hypofractionated radiation therapy. Newer approaches now being studied give radiation over an even shorter period of time. In one approach, larger doses of radiation are given each day, but the course of radiation is shortened to only 5 days. In another approach, known as intraoperative radiation therapy (IORT), a single large dose of radiation is given in the operating room right after lumpectomy (before the breast incision is closed). Other forms of accelerated radiation are described below in the section on brachytherapy. It is hoped that these newer approaches may prove to be at least equal to the current, standard breast irradiation, but few studies have been done comparing these new methods directly to standard radiation therapy. It is not known if the newer methods will still be as good as standard radiation after many years. For this reason, many doctors still consider them to be experimental at this time. Women who are interested in these approaches may want to ask their doctor about taking part in clinical trials of accelerated breast irradiation now going on. 3D-conformal radiotherapy: In this technique, the radiation is given with special machines so that it is aimed better at the area where the tumor was. This allows more of the healthy breast to be spared. Treatments are given twice a day for 5 days. The main short-term side effects of external beam radiation therapy are swelling and heaviness in the breast, sunburn-like skin changes in the treated area, and fatigue. Your health care team may advise you to avoid exposing the treated skin to the sun because it may make the skin changes worse. Changes to the breast tissue and skin usually go away in 6 to 12 months. In some women, the breast becomes smaller and firmer after radiation therapy. Having radiation may also affect a woman’s chances to have breast reconstruction. Radiation therapy of axillary lymph nodes also can cause lymphedema see the section, (“What will happen after treatment for breast cancer?”). In rare cases, radiation therapy may weaken the ribs, which could lead to a fracture. In the past, parts of the lungs and heart were more likely to get some radiation, which could lead to long-term damage of these organs in some women. Modern radiation therapy equipment allows doctors to better focus the radiation beams, so these problems are rare today.